At 5AM I awoke to see the Cedar Fire on a ridge line about 5 miles away where it had just swept through Muth Valley, killing 14 people. In less than 10 minutes there was a huge wall of flame around my home and studio. I was extremely fortunate to escape without injury, but lost everything except my little truck, my laptop and a drawer from my dresser with a few pieces of my own jewelry and the photo of my mom that I swept off the top of the dresser. This was the first night of the fire, so I had no idea it was burning and had no time to prepare. There were no sirens, no warnings of any kind. When I saw the fire I pulled on some clothes and by the time I got downstairs with my laptop there was fire all around the house. 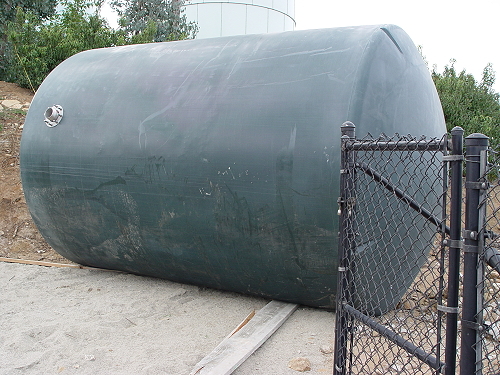 There was 450 gallons of propane behind me and 125 gallons just below the house, filled three days before, so it seemed I had better not wait around to see what would happen to those tanks. I drove down my long, steep, windy driveway unable to see anything for the smoke and fire, hanging out the door trying to see the edge of the driveway, listening to that massive fire breathing. Pretty exciting! First, order a new kayak. Then get the huge mess cleaned up and get something to live in onto my property. I kept buying trailers, assured by the vendor there would be "no problem" getting them up here then having to exchange them because they were too big to be moved onto my site. He tried really hard! He even ripped the radiator out of his 8,000 lb truck which he tried to tow up here to see if he could pull that much weight up the 27% grade (ummm, no). It was just another of the many near catastrophic episodes in this project. Thank God no one was hurt building my new house. 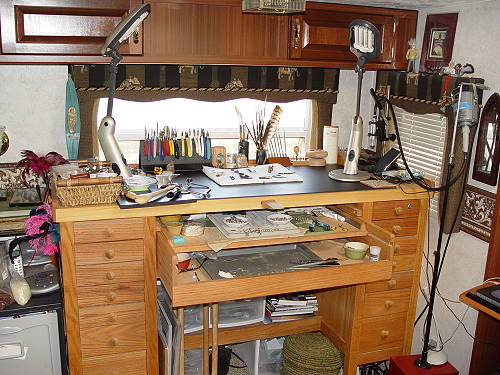 Anyway, after two months of trial and error, I finally had a new home, a very nice 27' travel trailer. I put the little couch in storage and put my jewelry bench in its place. The bench fit into the little popout but the ceiling was very low -- note the nice pointy light fixture right overhead. I found I'm not a very quick learner (ouch). It was very cozy. 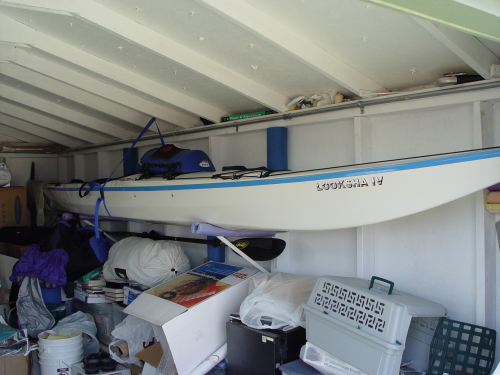 I also needed someplace for my torches, polisher and kayak so I built an 10'x18' garden shed -- narrow enough to fit in a little cubby near the trailer and just barely long enough for the boat. The astro turf made me laugh every time I looked at it, at first it was the only green thing for miles around. It did serve a purpose by keeping the area from becoming a big mud puddle in the torrential rains that followed the fire. This photo was taken after those rains when the weeds had come back nicely. 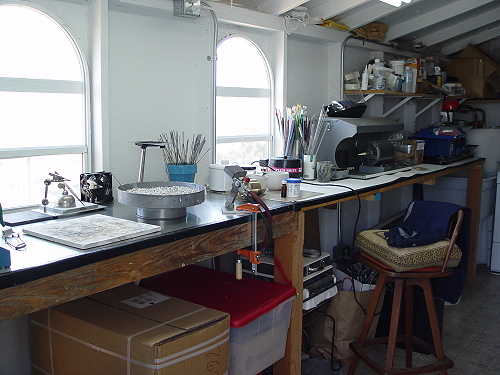 The shed had a nice work area on one side, and was complete chaos on the other. I measured the temperature on the sunny bench surface one summer day: 129 degrees. Nice boat, huh? Carbon fiber! Amazingly fun!! Work finally began on the house, complicated by the fact that the cement truck couldn't get up the driveway. Eventually it started to look like a house. But then after a year and a half the contractor decided he could not trick my lawyer (I have never had to get a lawyer before in my life) and quit. It was one of the happiest days of my life! He left little projects for me like the 5000 gallon water tank lying on its side near the pad he built for it on my neighbor's property. Sigh. It was continuous dripping water torture with that guy. The board is there to hold the tank because it was lying on a fairly steep hill. But no worries, see that little yellow rope holding it? It was rated at 10 lbs. The house wasn't finished and had a lot of major defects. But he was finally OUT of my life! I took over as contractor and a whole group of wonderful subcontractors pitched in to finish the house almost 3 years to the day after the fire. I feel so fortunate to have such a beautiful new home! Three years sounds like a long time, but when I finished in 2006, fewer than half of the thousands of homes lost in the Cedar Fire had been rebuilt. It burned 25% of San Diego county. 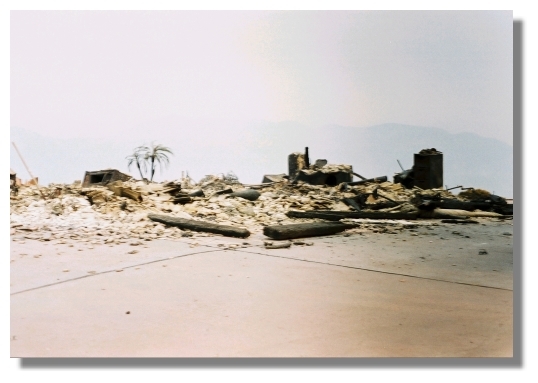 In 2007 fires once again roared through and destroyed more homes, though this time fire management and evacuations were handled vastly better than in 2003. I was able to sell the pretty little trailer and hired the same company to remove it that brought it up here. Unfortunately it was not the same driver. I spoke to them on several occasions before the event, each time I strongly recommended that they bring a second truck and attach a chain to the rear of the trailer to make sure they could stop it. But he arrived without assistance. Things did not start well when he tried to remove it from the trailer pad. 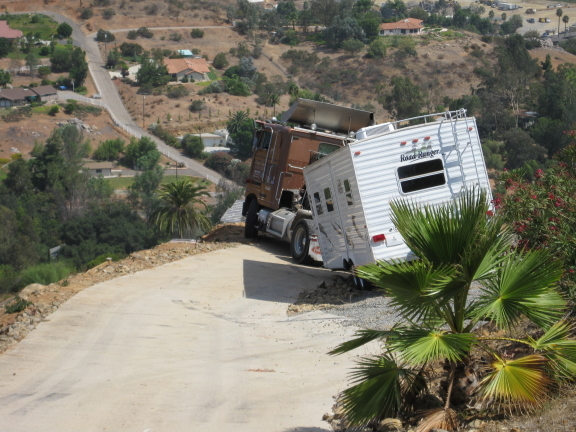 Somehow the unpaved edge held and he managed to avoid driving his truck off the cliff. He made it down around the tight 130 degree turn, then around an even tighter 90 degree turn. However, when he was almost at the bottom he lost his brakes thereby jackknifing the trailer slightly and terrifying me for the second time that day. He managed to miss a big metal post by an inch or so, so the trailer was not damaged. He tried cutting off my heavy post with a little grinder but gave up after 45 minutes. He spent an hour doing fabulous burnouts trying to back up and succeeded in nosing the tractor straight into a big boulder. It was nice of the boulder to hold the tractor or he would have gone into a deep ditch. He tried burning out the transmission on his wife's little pickup by having her try to pull the trailer and tractor uphill backwards from the road below. He finally got a big truck which was able to pull it back far enough for him to make the turn. 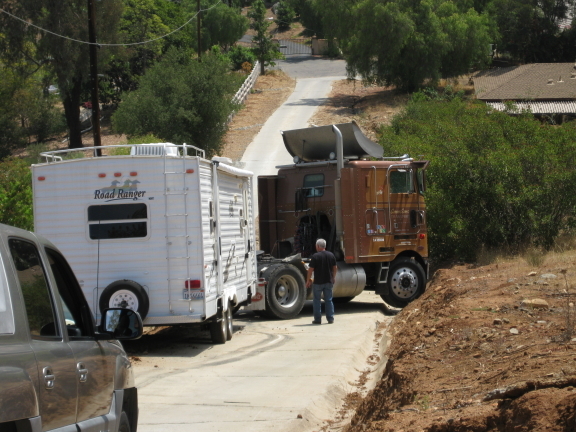 The new owner was stuck behind him as you can see for about 6 hours, afraid to back up the hill and with nowhere to turn around. It was very hot so I hiked up and down the hill many times with cold water, juice and snacks. They all eventually got out safely. The adventures never end. At any rate, I now have a home and a beautiful large studio with no pointy light to bump my head on. You can see Sombrita holding my pliers hostage. 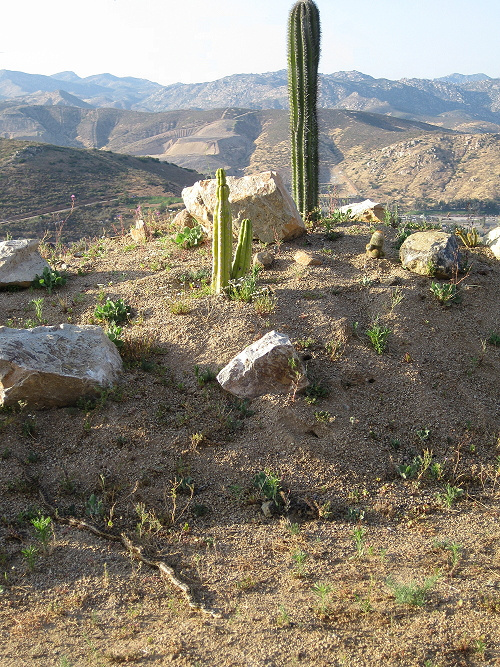 And I'm starting to put in some nice cacti like the gorgeous cardon which should begin to branch within the next 50 years or so. The locals seem to like the place as you can see. So far I've found 5 species of snakes on my property and there should be a few more. There are lots of interesting lizards, rabbits, squirrels, bobcat, grey and red fox, coyotes, raccoons, 'possums and once in a while a cougar wanders through. What a wonderful place to live! After the fire I was overwhelmed by the kindness of friends and strangers. Two different friends gave me shelter while I was trying to get the trailer up onto my property so I could return home. An army of friends helped dig through the rubble trying to salvage anything of value (it was pointless but they didn't complain). 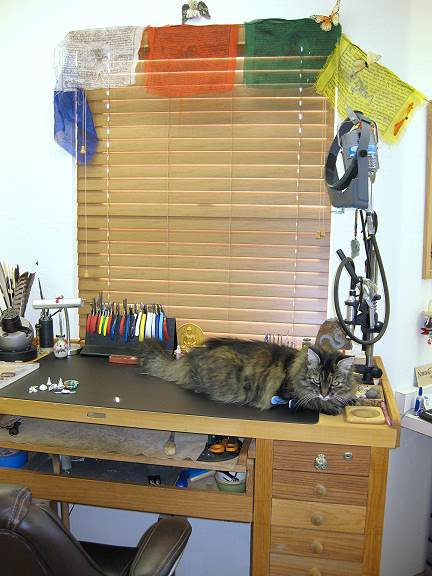 Companies large and small gave me free advertising, shows, and steep discounts on beads, books and tools. Friends and strangers from the amazingly loving and concerned bead world sent tools, supplies, an incredible array of beads, warm wishes, prayers and encouragement. I am incredibly grateful to all of you!!!!!!!!!!!! Given that anyone can be faced with losing home and business due to fire, flood, hurricane, earthquake, etc. there are some things I wish I had done or known to do. There are some things I did do and was grateful not to have to worry about. I'll list what comes to mind here in hopes someone else will find it useful. Feel free to contribute! Maybe we can help each other. 1) Be absolutely certain you know how to get your vehicle out of your garage in a hurry if the power is off so the electric door doesn't work and it's dark. It certainly would have been difficult to try to outrun this fire on foot as it was driven by 60-80 mph winds. My neighbor said it looked like a jet plane towed it across a 10-mile swath. 2) YES, you should have a disaster plan! In this case, I didn't have time to implement mine. 4) Scan all those important hand-written class notes and hand-drawn designs as you go. Copy those slides and photo CDs from the photographer. Store copies off site. 6) Years ago Robert Liu gave a lecture in which he asserted that an inventory of your bead collection was very important. Having a business inventory on my laptop helped me enormously in dealing with the insurance company. I wish I had an inventory of my book collection as well as my beads and supplies! As you may know, in order to collect your insurance, you have to list every single thing you lost. For example, my initial inventory said "box of needles." They said, "how many? what kind?" This has NOT been fun. Be aware that they may offer to forgive at least part of the inventory as a carrot to get you to settle your claim early and in their favor after their pressure tactics fail. I took the advice at www.carehelp.org (a fantastic resource) and waited them out. It was a good thing I did, but very challenging. 7) Photograph the rooms in your home and the special antiques, etc. Keep the photos off site/in the cloud. Remember you will have to list every single item you lost and its age and purchase price if you expect reimbursement. Need I mention that preparing such a list is a full time job? 8) When you finance your home, especially in California, consider taking exception to that clause in your deed that gives the mortgage company the right to hold ALL the insurance money after a loss, not just the loan amount. I remember noticing this clause in my deed but didn't think it through. Then I had the extreme misfortune to have Flagstar Bank as my mortgage company which made the problem ever so much worse. I'm not accusing them of being unethical. However, they have been unbelievably unhelpful since the fire. I've been a good customer and cannot understand the way they've behaved. Buyer beware! 9) If you have a home-based business, make sure there is a rider covering it on your policy. They may not be willing to cover finished work, but at least tools and inventory may be covered. 10) Your home may be under-insured as most of the homes lost in the Cedar Fire were despite the fact that you took the insurance agent's advice on the amount of coverage you need. Insurance is a competitive business remember. Check out www.carehelp.org. 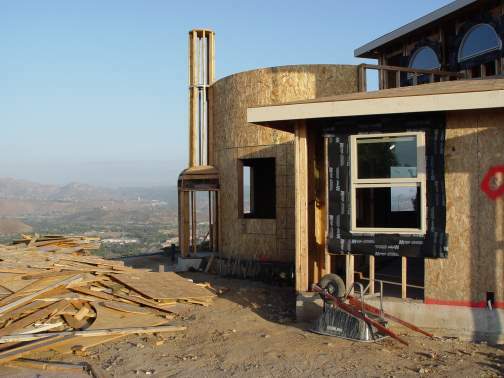 Although the reforms put in place after the Cedar Fire here in California have corrected this problem, I still recommend you talk to a contractor about building costs in your neighborhood and compare them to your policy limits regularly. 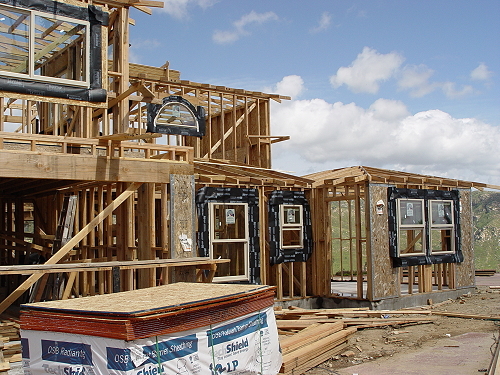 Unfortunately building costs also rise in a disaster situation simply due to supply and demand. 11) Do not rely on the Contractor's State License Board web tools to determine whether the contractor you plan to hire is competent and honest. Go in person to your local CSLB office and to the local building inspection office and talk to people about him or her. Call the state CSLB office and talk to a human. Note that when I filed my claim with CSLB and complained that they must have known about my contractor, they agent simply said, "I would be afraid to hire any contractor today." Their hands are tied in many ways, but a conversation might reveal a great deal. 12) Before you sign any contract, have it reviewed by a construction attorney. I really can't emphasize this strongly enough. 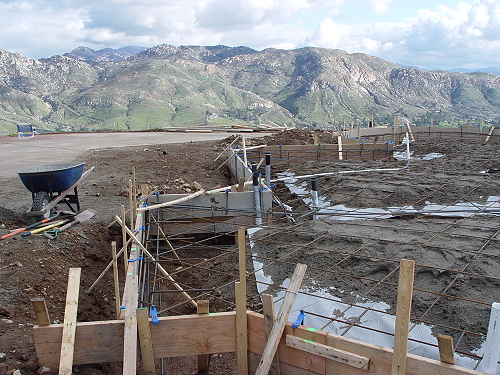 13) Hire an independent, certified building inspector to visit the work site every few weeks throughout the project. 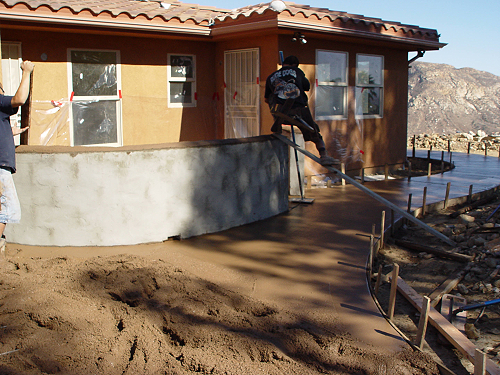 Your contractor should welcome the assistance. Remember the county inspector is looking for code violations only. 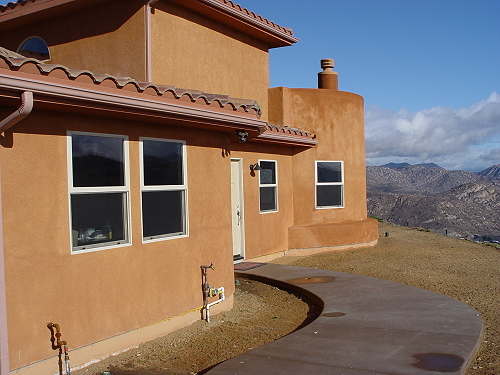 The building inspector will observe lots of other things that should be corrected while it is easy to do so.